Collerette type dahlias take on the form of a single dahlia but with a difference. They still retain the simple outer row of almost flat petals that can often overlap, and the centre of the flower is clearly visible as a disc. However, the disc is encircled by a ‘collar’ of small florets or petaloids that create an almost fluffy or ruffled look to the flower as a whole. Flowers are usually about 10 – 15 cm (4 – 6 inches) wide. Lilian Alice – this has deep purple outer petals with a raspberry edging. The centre is yellow and the collar is cream with raspberry flecks, making this a real eye-catcher. The foliage is dark green and the plant grows to a height of 90 cm (2 ft 11 inches). 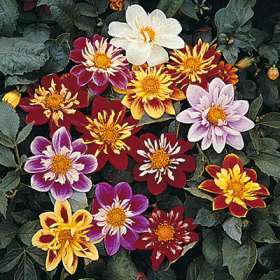 This is a small dahlia, with flowers that are 10 – 15 cm or 4 – 6 inches wide. Christmas Carol – as the name might suggest, this dahlia has scarlet red outer petals, a yellow centre and the Christmas effect is completed by the white and red speckled collar florets. It really is such a pretty flower and is good for exhibitions as well as general garden use. This grows to a height of 90 cm (2 ft 10 inches). Teesbrooke Red Eye – this has lavender purple outer petals with the collar petaloids being exactly the same colour. Yellow blends with a darker orange colour to form the central disc. This grows to a height of 100 cm (3 ft 3 inches).